In order to protect New York City’s water supply and prevent potentially contaminated water or chemicals from backing up into the public drinking water system should there be a sudden or unexpected drop in water pressure, many buildings and businesses are now mandated to install and maintain approved backflow preventers. If you do not comply with the new requirements you are subject to a costly violation and the threat of having your water shut off. Did You Receive a Backflow Violation? If you received an ORDER from the Department of Environmental Protection (DEP) that you premises requires a backflow prevention device and you’re not sure what to do, call AquaAudit. Our team of experts will handle everything for you. Can You Successfully Manage This Process On Your Own? Coordinating between government agencies such as the DEP and the Department of Buildings (DOB) or hiring a Professional Engineer or Architect to have plans drawn up and approved, hiring a Licensed Plumber to install your backflow device(s). Hiring a Certified Backflow Tester to perform an initial test, hiring an Administrator to process the requisite paperwork in a timely manner is a daunting and overwhelming task to try and undertake yourself. The initial step involves performing a thorough and comprehensive site-inspection of your property in order to determine if it actually requires a backflow preventer or if it’s eligible for an exemption. AquaAudit performs this necessary first step for free, at no-cost or obligation to you. If we determine your property does need a backflow prevention device(s) we will provide you with a cost estimate detailing the entire scope of the job. Should you wish to move forward with the project, our Professional Engineer (PE) or Registered Architect (RA) will prepare two sets of plans for your property. These plans will be submitted with two application forms to DEP’s Cross Control Unit for approval. Once approved, DEP will notify you and return a copy of the plans to our Engineer or Architect. Then, a Licensed Master Plumber must install the backflow prevention device(s) in strict accordance with those DEP approved plans. The installation must also comply with the DOB regulations and requirements. DEP requires that all backflow device(s) must be properly maintained with annual testing and inspection by a Certified Tester on a go-forward basis. 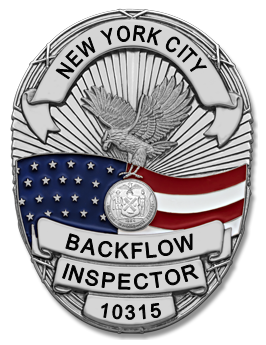 To remain compliant with New York State and New York City DEP backflow regulations, building owners and property managers are required by law to have all of their RPZ’s and backflow prevention devices tested annually by a Certified Backflow Tester. AquaAudit is a licensed, dedicated and experienced testing and repair company. Our technicians can test, install and repair all makes, models and sizes of backflow prevention devices. We handle the entire process for you – annual testing, report filings and scheduling. We’ll make certain you’re up to code and avoid costly violations, court time and legal expense. DEP has become more vigilant in their inspections and building owners are subject to violations resulting in costly fines of up to $1,000.00 per device. We offer guaranteed annual pricing and notify you with automatic reminders 2 months prior to each scheduled test. AquaAudit is the preferred backflow testing service of building owners and property management companies in the tri-state area and currently provides annual testing throughout the 5 boroughs of New York, The City of White Plains, all of Westchester and Rockland Counties, Long Island and New Jersey. Backflow prevention devices prevent contaminated water or chemicals from flowing back into the public drinking water supply system. The type of device required, depends upon the degree of hazard posed. Certain types of businesses are legally mandated to install and operate approved backflow preventers. Backflow prevention devices are an important component of the New York City DEP’s drinking water protection program and are legally mandated under the New York State Sanitary Code and Rules of the City of New York for those businesses identified as posing a risk to the public water supply. How can I be certain my property requires a backflow prevention device? To determine whether or not your property requires a backflow prevention device, you must retain the services of a Professional Engineer (PE), Registered Architect (RA) or Licensed Master Plumber (LMP) and request a site-inspection of your property. Property owners are required to install, maintain, and test backflow prevention devices according to all relevant City and State codes. Tenants are not responsible for backflow prevention devices. How can I avoid a Notice-of-Violation if I received an ORDER from DEP? As long as DEP has received certification from a Licensed Master Plumber (LMP), Professional Engineer (PE), or Registered Architect (RA) that a device is in the process of being installed, you will not receive a Notice-of-Violation. How do I schedule annual testing for backflow prevention device? You must schedule testing with a certified tester at least once a year and file appropriate forms with DEP. Contact AquaAudit to schedule your building’s annual test. What if my building has a backflow device but DEP has no record of it? You must ask your Professional Engineer (PE) or Registered Architect (RA) to send a record drawing of the backflow preventer along with an initial test report of the device to DEP for review. How do I file for exemption from backflow prevention regulations? If eligible, a Professional Engineer, Registered Architect or Licensed Master Plumber must file all exemptions on behalf of the property owner. They will need to provide all required information in a typed letter on their letterhead and fully state that all necessary exemption conditions have been met. All letters must be sent to DEP for approval. Exemption requests should be filed according to DEP’s exemption guide.